Desafiando a Nomenklatura Científica: CRISPR: um novo princípio da engenharia do genoma ligado a mudanças conceituais na biologia evolutiva!!! CRISPR: um novo princípio da engenharia do genoma ligado a mudanças conceituais na biologia evolutiva!!! The Lamarckian and Darwinian modalities of CRISPR-Cas. a Efficient self versus non-self discrimination: Lamarckian mechanism. b Limited self versus non-self discrimination: Darwinian mechanism. The CRISPR-Cas systems of bacterial and archaeal adaptive immunity have become a household name among biologists and even the general public thanks to the unprecedented success of the new generation of genome editing tools utilizing Cas proteins. 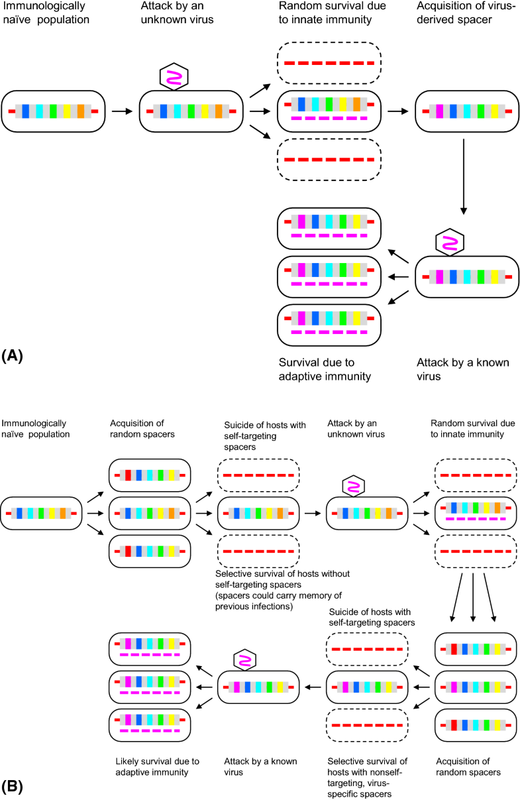 However, the fundamental biological features of CRISPR-Cas are of no lesser interest and have major impacts on our understanding of the evolution of antivirus defense, host-parasite coevolution, self versus non-self discrimination and mechanisms of adaptation. CRISPR-Cas systems present the best known case in point for Lamarckian evolution, i.e. generation of heritable, adaptive genomic changes in response to encounters with external factors, in this case, foreign nucleic acids. CRISPR-Cas systems employ multiple mechanisms of self versus non-self discrimination but, as is the case with immune systems in general, are nevertheless costly because autoimmunity cannot be eliminated completely. In addition to the autoimmunity, the fitness cost of CRISPR-Cas systems appears to be determined by their inhibitory effect on horizontal gene transfer, curtailing evolutionary innovation. Hence the dynamic evolution of CRISPR-Cas loci that are frequently lost and (re)acquired by archaea and bacteria. Another fundamental biological feature of CRISPR-Cas is its intimate connection with programmed cell death and dormancy induction in microbes. In this and, possibly, other immune systems, active immune response appears to be coupled to a different form of defense, namely, “altruistic” shutdown of cellular functions resulting in protection of neighboring cells. Finally, analysis of the evolutionary connections of Cas proteins reveals multiple contributions of mobile genetic elements (MGE) to the origin of various components of CRISPR-Cas systems, furthermore, different biological systems that function by genome manipulation appear to have evolved convergently from unrelated MGE. The shared features of adaptive defense systems and MGE, namely the ability to recognize and cleave unique sites in genomes, make them ideal candidates for genome editing and engineering tools.